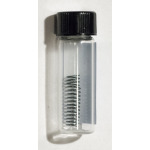 Nitinol spring for demonstration purposes. For easy transfer it comes packed in glass vial. Activation temperature is 30-40°C. Length is 20mm, diameter is 5mm and wire diameter is 0,5mm.